Comptoir Sud Pacifique Vanille Coco perfume evokes an island feeling that makes you feel like you're on vacation. This fragrance for women expertly combines the sweetness of heliotrope and banana cream with the smoothness of island vanilla and coco milk. The fragrance's flowery and fruity scents are balanced, so it's neither too sweet nor too cloying. Comptoir Sud Pacifique introduced this lush perfume in 2003, and it is an excellent companion for those days when you want to feel like you're visiting your own private island. Every once in a while I crave a vanilla/coconut fragrance which this one is from start to finish. Nothing subtle about it either. On the other hand, it does not, at least to me, smell cheap. 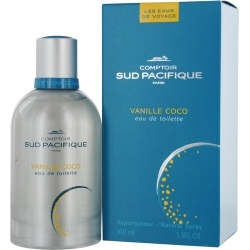 Whenever I need something really comforting, I go for Comptoir Sud Pacifique Vanilla Coco. Vanilla CoCo --I took a chance last year and purchased this fragrance--since I have a lot of allergies to various flowers I prefer to stay with scents with vanilla---I'm thrilled that I took the chance for I really love this scent. Comptoir Sud Pacifique Vanille Coco has been my favorite scent for years, i get so many compliments on it. Especially, by men!!! I have several allergies and must always steer away from very floral notes--this scent is fabulous. I never purchase any fragrance without first purchasing a small sized bottle, but this time I chose to take a chance and glad I did. I love vanilla and coconut scents. All the fragrances I wear are with notes of vanilla. Am pleased that I took the chance and purchased this scent. I love it. You can wear this Fragrance anytime, it is wonderful.